Energy Saving Tips for Your Home from the US Dept of Energy - Very Good Ideas! When I was contemplating the steps we’re taking this year to save money on our energy bills, I thought this would be a quick post on top energy savings tips with high ROI. However, in checking out some other sources, I came across a wealth of information that I couldn’t help but share as well. For instance, I didn’t even know about this comprehensive manual the US Dept. of Energy puts out, but it’s full of useful stats and energy conservation tips. It’s probably the most useful thing I’ve seen out of our government in ages. They’re trying – especially now with this cash for caulkers program coming. Since I hadn’t heard of this manual before it’s a huge read, I figured I’d share a summary of my favorite high ROI energy saving tips. Of course, depending on which region you live in and the type of housing you’re in, these levels will differ, but if you live in a “typical” area and house, you could reasonably expect to see expenditures like this. Using the 80/20 rule, perhaps you want to focus on the couple largest segments first. Water usage/heating Install aerating, low-flow faucets and showerheads. They will save you about $30 or more in electricity costs over each bulb’s lifetime. Producing about 75% less heat, they are safer to operate and can cut home cooling costs. Programmable thermostats do cost $35 to $100, and professional installation can cost an additional $75 to $100, but homeowners can save about $180 a year with a properly set one, according to the Department of Energy. Gasoline – There’s a section on gas savings that I’ve pretty much hit in this article HERE. Energy audits are a great idea, and some utility companies will offer them for free. There are independent professionals out there, too, who can take a holistic approach to your entire structure and help you make it as energy efficient as possible. Ahhh, proof that the Space Heater is an electricity sucker! 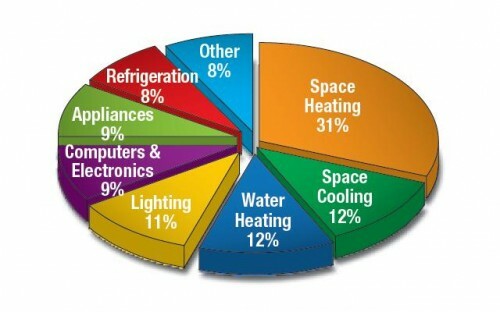 Is space heating really more expensive than turning on the gas furnace though? Is there some metric/experiment one can view for more data? I just feel bad turning on the furnace if I’m only in one room given my house has 2 other bedrooms.